What an amazing weekend at CFSF! This one of the greatest days a CFSF. The feel of the competition and energy in the air was felt all morning. Everyone did a tremendous job! It was such a great event to be apart of and witness. We are so proud of everyone. Also, a BIG Thank You to everyone that helped out. And a BIG Congrats to all of the participants in the Paleo Challenge and CFSF Games. Way to Go Kim and Rob for winning our Paleo Challenge! They took home $600 each and one month of UNLIMITED membership!!! And Congrats to the Finalist! Post your thoughts and give your congrats to the winners on yesterday’s events. 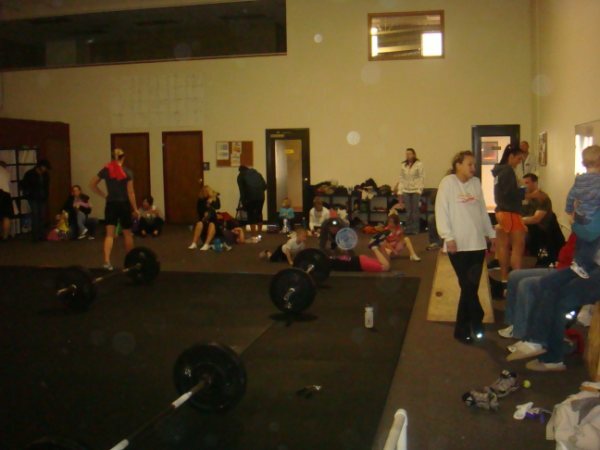 This entry was posted on March 21, 2010 at 10:51 pm and is filed under CrossFit Workouts, Members. You can follow any responses to this entry through the RSS 2.0 feed. You can leave a response, or trackback from your own site. Congrats everyone! Saturday was super fun! Super bummed i wasn’t able to come watch, but a huge CONGRATS to all the Paleo Challenge and CFSF Games participants and winners!!! What an amazing bunch of dedicated people!!! Wow! The competition was such an awesome experience! I haven’t had the chance to compete in a long time, and I forgot how great it feels. It’s amazing how much farther and harder you can push yourself when you’re under the gun like that. Thanks Chris and Annie for putting it on for us! Also congrats to the winners of the Paleo Challenge. I can’t even express how proud I am of you for making the lifestyle change, sticking with it, and doing amazing things with it. Everyone did a fantastic job! The energy in the box was amazing!! Each person that participated (either in the Games and/or the Paleo) are winners!!! Congrats to All!!! CFSF Rocked!!! congrats to all… was fun to be a part of!! !